Every hour you spend on your staffing agency back office operations is an hour you could have spent finding quality candidates or growing your business. That’s where we come in. 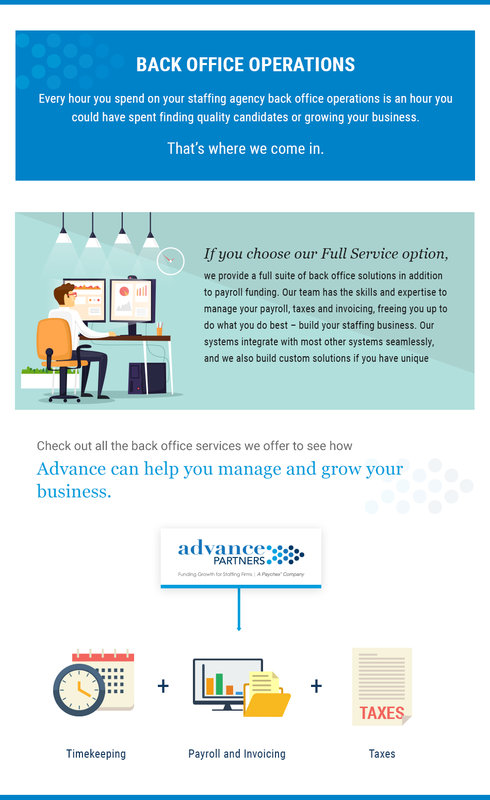 If you choose our Full Service option, we provide a full suite of back office solutions in addition to payroll funding. Our team has the skills and expertise to manage your payroll, taxes and invoicing, freeing you up to do what you do best – build your staffing business. Our systems integrate with most other systems seamlessly, and we also build custom solutions if you have unique needs. Check out all the back office services we offer in the blue section below to see how Advance Partners can help you manage and grow your business. To start a conversation, request a free consultation. Use ours or integrate with yours.